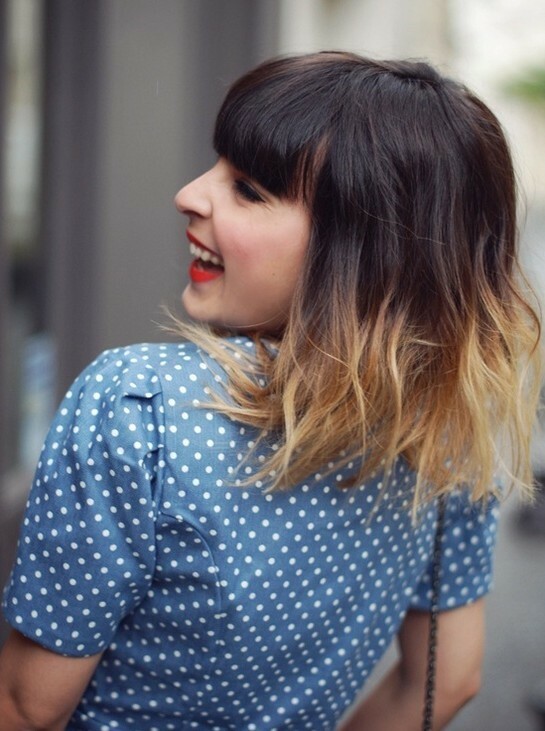 Inside: Are you looking for some medium length hairstyles to copy? Enjoy browsing through these 25 ideas! I’ve had a lot of people ask what I’m doing to grow my hair out. One thing I’ve been doing is putting Argan oil on my hair every morning. It’s never been so soft and manageable and the brittle ends are gone. That one change has made it so much easier to style my hair + it looks ten times better. Related blog post: If you’re trying to grow out your hair and you feel like it’s taking forever, read my post on how to grow your hair faster. It shares a ton of tips and product recommendations to get you closer to hair you love. Are you ready to browse through some gorgeous ‘dos? 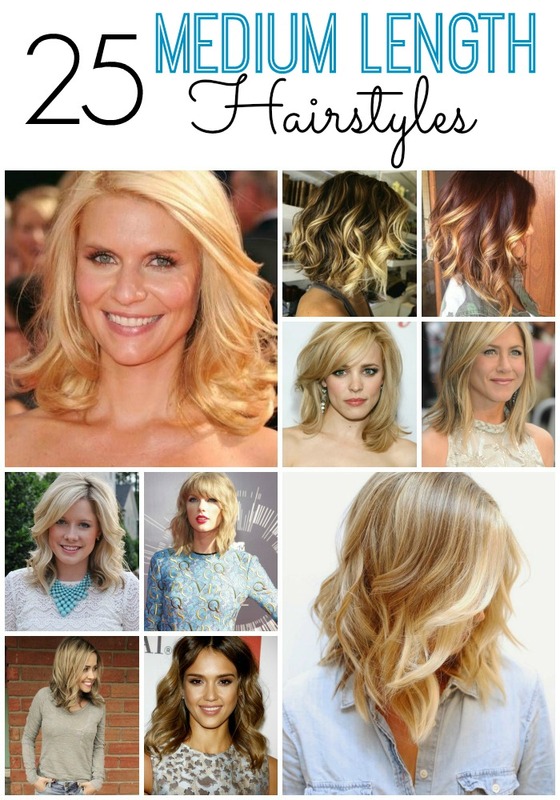 These 25 medium length hairstyles have a lot of variety and I’m pretty confident you’ll find one (or more) to copy. Claire Danes wears long blond layers so well. You can dress this hairstyle up or down, wear it curly or straight or even go with an up-do. See why I want to go back to medium length hair? You can do so much with it! I love this look of shorter in the back and long layers on the side. Not to mention the color is stunning! Jennifer Aniston is the actress who will always be known for her amazing hair. She is sporting long, straight layers that taper her face perfectly. 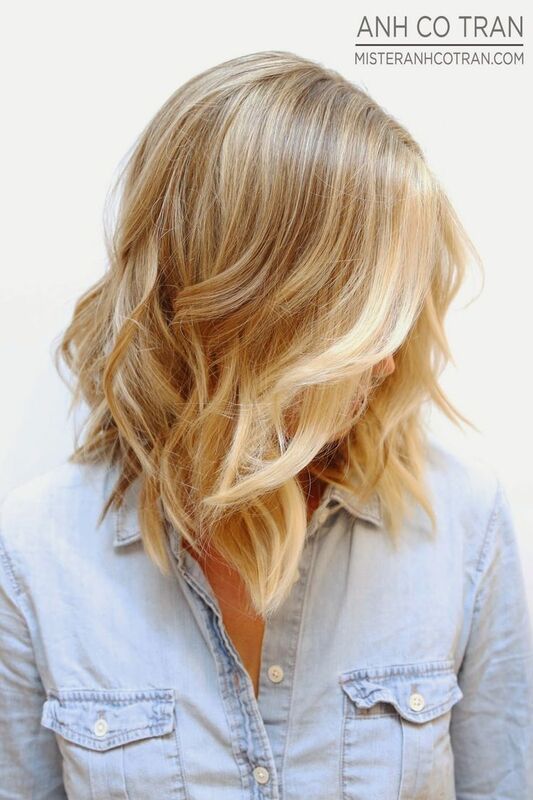 The beachy highlights and side part make this hairstyle a great choice for everyday. I’ve achieved a similar color with this product. This hairstyle is similar to Jenifer Aniston’s pictured above, but with a little more tousle and wave to it. This is one of my favorite looks on Rachel McAdams. It’s longer than a traditional bob, with side swept bangs for a dramatic look. This style frames her face perfectly and makes her eyes pop. Here’s another tousled look with some gorgeous waves. I love how the hair around the face is a lighter blond than the rest. Just stunning. This style on Taylor Swift is perfect for those of us who have naturally wavy hair. You can just let it do its thing! She’s wearing her medium length hair with full bangs. Here’s another wavy hair look with side swept bangs on actress Kristen Bell. If you already have some natural wave in your hair, this is a very easy look to achieve. If your hair is straight, you can use a curling wand to get some beachy waves. 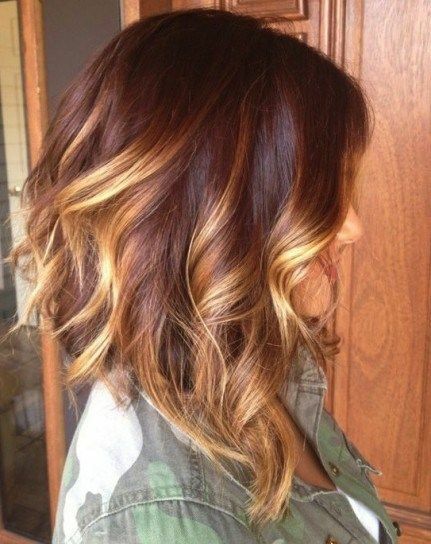 Not only is this a great cut, but a beautiful caramel color style. She has a little bit of wave, with soft blond highlights throughout. Have you thought about blunt bangs before? This straight medium hairstyle could potentially drag your face down, but the bangs give it some lift and help frame the face perfectly. Jessica Alba knows how to wear ombre right. With subtle waves, a middle part and subtle lightening of the hair, this is one style I definitely want to try. She looks sophisticated enough for the red carpet, but it’s casual enough for everyday wear. For these larger waves, take a large curling iron like this one and only leave in your hair for a few seconds. 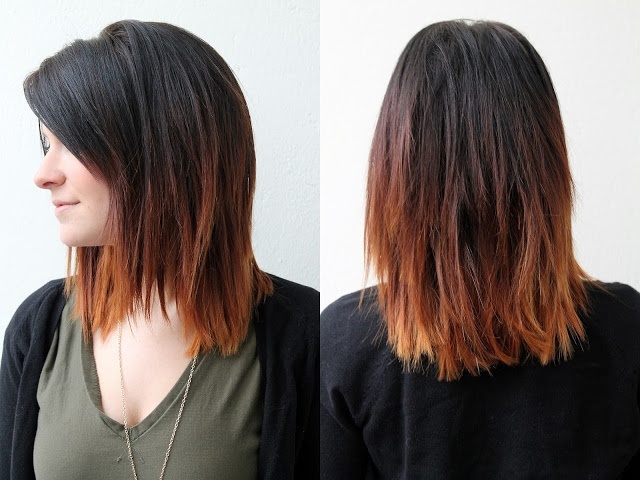 Here’s another shoulder length style with ombre. This is a straight and choppy style with short layers in the back and face-framing layers in the front. This hairstyle features a more choppy look. To achieve this, leave the very ends of your hair out of the curling iron so it does not curl under. Pull the curling iron through your hair and stop right before you get to the end, and then curl. Only leave it in for a few seconds and then tousle with your fingers to create light waves. I absolutely love this cut and color. I prefer my hair curled and this is perfection. I also love the lighter color around the face and darker throughout. If you’ve never visited thesmallthingsblog.com for hair tutorials, you are missing out. She has some of the best of the best videos and step-by-step pictures for medium length hair. This is one of my favorite looks – wavy with side swept bangs. I remember mimicking Nicole Kidman’s curly do from the 90s and although that’s still my favorite look on her, she can definitely pull off a medium length, sleek and straight bob like this one. She looks fierce! Actress Gabrielle Union looks stunning and always has great hair. 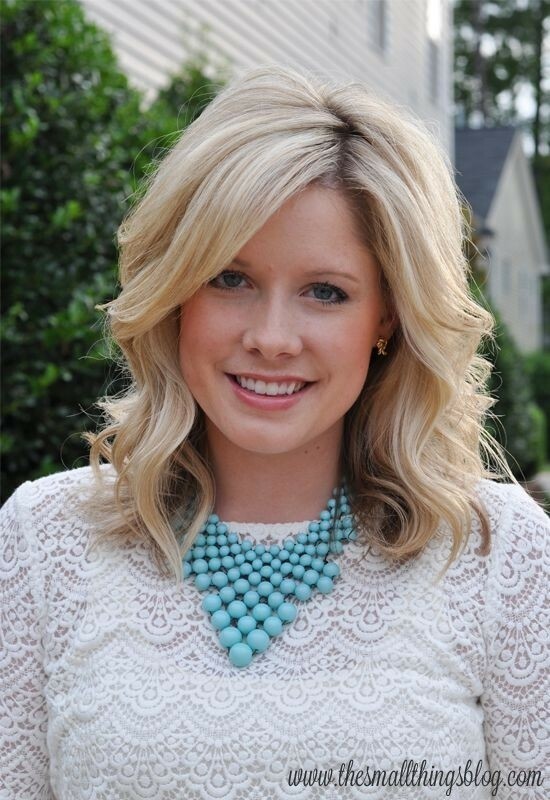 This medium length hairstyle is perfect for her, with the soft waves and very subtle highlights. Whether Cameron Diaz’s hair is long, short, medium, straight or curly – she always looks great. This medium length with waves and bangs is perfect for her. The before and after photos on this site really show you the dramatic change just a few inches can do, plus a good color. This model went from long and stringy, to medium length and wavy. It suits her perfectly. Straight and blunt bangs – a look that not everyone can pull off. But if you can, go for it! Bangs can make you look years younger and completely change your look, giving you a fresh, vibrant look for spring. 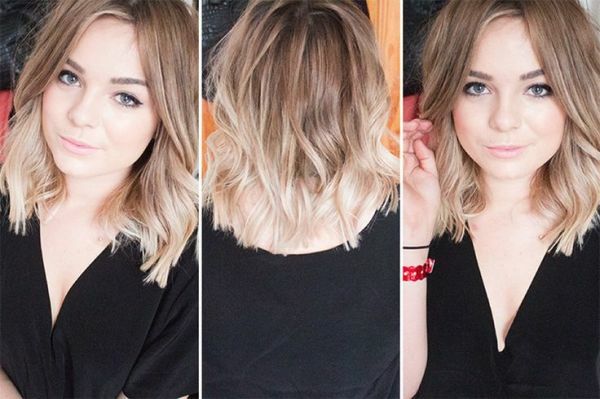 This medium length hairstyle has very short layers throughout the top, giving her hair tons of volume. It’s also heavy on the bangs and face framing layers. What do you think of this bold look? Blunt bangs and dark on top, with a statement-making switch to blond on the bottom. Little Miss Momma not only has gorgeous hair, but a striking personality to match! I love this cut and color on her. She is my current hair envy. Hillary Scott from the group Lady Antebellum looks fabulous with her medium length cut and blond highlights. This is a beautiful style on her. Last but not least, another stunning transformation from long hair to medium length hair. She looks absolutely adorable! So what do you think? 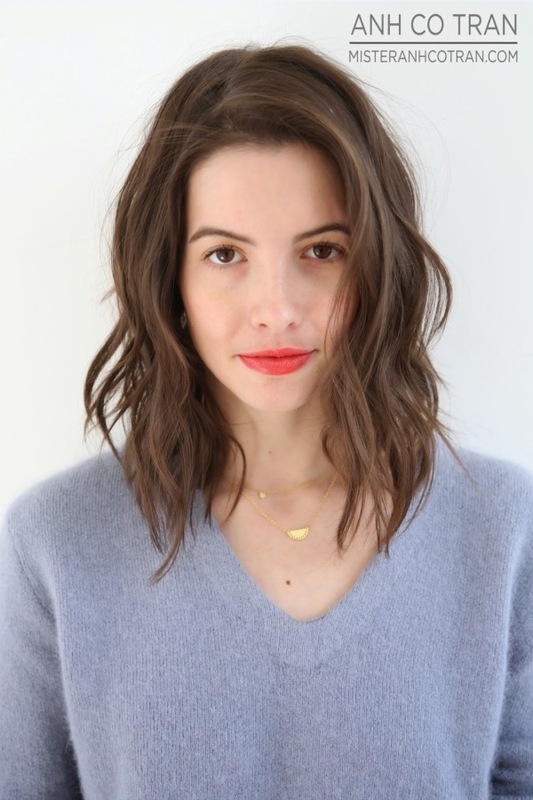 Are there some medium length hairstyles featured here that you’re tempted to try? 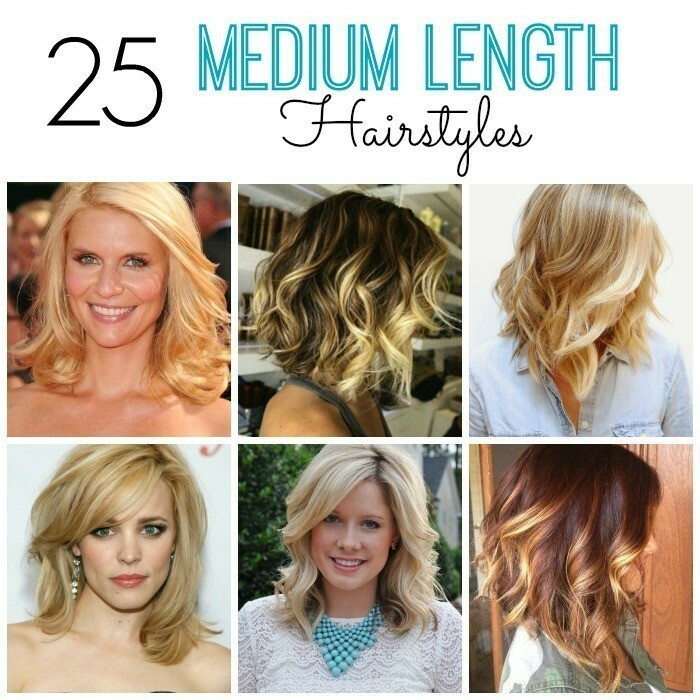 Looking for More Medium Length Hairstyles? Are you a pinner like myself? Great! Be sure to follow my Hairstyles board for daily outfit inspiration. Marie Claire also has a really nice shoulder length hair round-up featuring celebrities for 2017. I love this roundup. My hair is medium length. I usually do a sleek Bob but I love the wavy looks. I am really loving all the toussled looks, those are my favorite. I need to bookmark this for when I get rid of my short hair, but for now I am happy with my super short! I SO wish I had the face for a lob! Love love love! I was looking through your list and wanted to offer some advice. If you have a cowlick or widows peak in your front hair line, straight across bangs are a bad idea. They just won’t lay the way you want them to. Side parts are most flattering. It is very difficult to pull off a center part. Side bangs and anything that frames the face is your best bet. Longer in the front and shorter in the back can be a hassle to put up in a pony tail. Not all of your hair will fit. And with time put into blow drying and styling and high quality products, you can typically make your hair do just about anything. I’m sorry to hear that Kate! I did not edit any of the photos myself. Can you tell me which one is yours? I can add a link underneath if you’d like, or you could send me the original photo? These hairstyles are perfect for my hair length, so now I really want to try some of these out. 🙂 I love Jessica Alba’s hairstyle! Jennifer Aniston is beautiful as always. 🙂 Love his hairstyle on this picture, I have something similar right now. I love the cut you had when blonde, but I love the richness of your color & complexion as a brunette.